Similar activity has been documented and explained previously where seasonal sheets of frozen carbon dioxide form and thaw near Mars’ south pole. Details of the different northern seasonal changes are newly reported in a set of three papers for the journal Icarus. 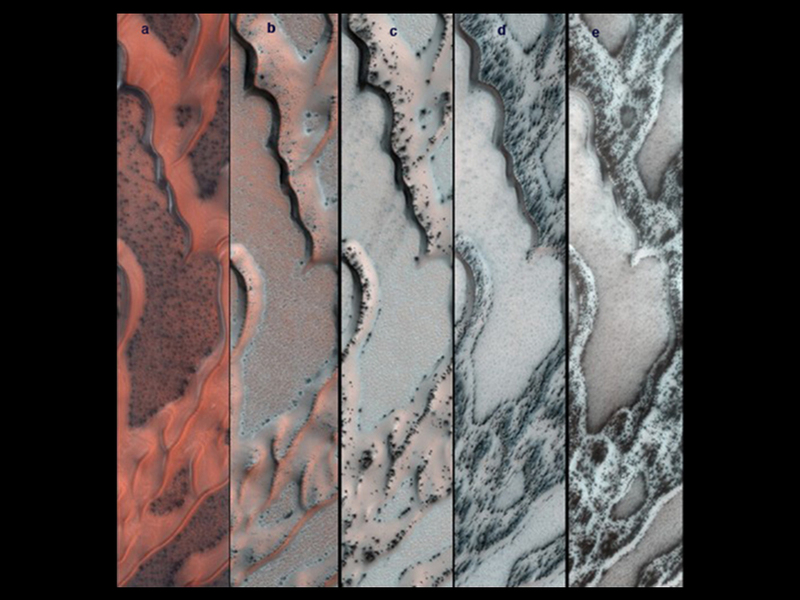 With three Martian years (six Earth years) of data in hand from the Mars Reconnaissance Orbiter’s High Resolution Imaging Science Experiment (HiRISE) camera, the researchers report on the sequence and variety of seasonal changes. The spring changes include outbursts of gas carrying sand, polygonal cracking of the winter ice blanketing the dunes, sandfalls down the faces of the dunes, and dark fans of sand propelled out onto the ice. The process of outrushing gas that carves grooves into the northern dunes resembles the process creating spider-shaped features in far southern Mars, but the spiders have not been seen in the north. The seasonal dry-ice sheets overlie different types of terrain in the two hemispheres. In the south, diverse terrains include the flat, erodible ground where the spiders form, but in the north, a broad band of sand dunes encircles the permanent north polar ice cap. The University of Arizona, Tucson, operates the HiRISE camera, which was built by Ball Aerospace & Technologies Corp., Boulder, Colo. The Johns Hopkins University Applied Physics Laboratory, Laurel, Md., provided and operates CRISM. NASA’s Jet Propulsion Laboratory, a division of the California Institute of Technology in Pasadena, manages the Mars Reconnaissance Orbiter for NASA’s Science Mission Directorate in Washington. Lockheed Martin Space Systems, Denver, built the orbiter.